Christmas is a time when the whole community can agree on enjoying themselves. It is a time of family, fun and food. It is the time of giving and receiving presents and messages of goodwill from old friends. In this way, Christmas is good for society. It is good that we take time out to relax and enjoy ourselves. It is good that we keep up contacts with family and friends. It is good that we keep the retail industry busy and profitable. It is good that we are able to be generous and teach generosity to another generation. It is important to preserve our cultural heritage. Even such an ardent opponent of Christianity as Richard Dawkins would not like to stop Christian traditions like Christmas. He would not want to purge our culture of its Christian history. He has expressed his opposition to de-Christianising greetings like “Happy Holiday Season”. He professes to enjoy singing Christmas carols. This year the calls about Christmas being too materialistic have been muted. The Prime Minister’s desire that we spend freely so as to boost the economy has made materialism in Christmas 2008 morally responsible, if not mandatory. But can Christians agree with the materialistic celebration of Christmas? Should we not stand against such crass hedonism and debasement of spiritual issues? The debasement of spiritual issues in Australian society is often pretty crass, for the hedonism of our society is often expressed in alcohol-fuelled stupidity. Materialism as a philosophy of life is a self-defeating, inadequate sub-human myth. The idea that “there is nothing in reality other than matter” reduces all of us to worms, to dust and ashes. It makes values, virtues and, even thought, into nothing other than the twitching of disordered grey matter. Justice, love, mercy, and kindness are all nonsense in a materialistic universe. They are all the tools of the masters to manage and oppress the masses. And the hedonism that flows from philosophical materialism is also a self-defeating and inadequate myth. Those who say "let's eat and drink for tomorrow we die" - pursue a goal of pleasure that always evades them. They often hasten their death while missing out on the pleasure and pleasures of life. 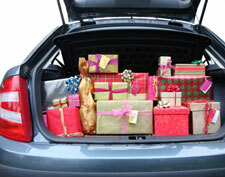 So how can Christians share in the materialistic hedonism of Christmas? The Bible does not advocate the opposite of materialism or hedonism. The opposite of materialism is the denial of matter and the opposite of hedonism is the denial of pleasure. Combined they lead to a miserable asceticism that finds no joy in the pleasures of this world. This is never the teaching of the Bible. According to God such a denial of the pleasures of creation is the teaching of demons (1 Timothy 4:1-5). The trouble with materialism and hedonism is not that they are completely wrong, but that they profoundly distort the truth. The truth is that God has created the material world and this created world is good. It is to be received with thanksgiving to its creator “who provides us with everything to enjoy” (1 Timothy 6:17). We are not to worship the world like materialistic hedonists in idolatrous sensuality. Rather we are to worship the world’s creator with thanksgiving and joy - for his wonderful creation. All this comes into sharp focus at Christmas because at Christmas time Christians celebrate when God becomes man. We celebrate the creator becoming part of the creation. It is even more forcefully expressed in John 1:14: “the word became flesh”. Though God is Spirit and those who worship him must do so in Spirit and truth (John 4:24), in the person of Jesus, God is incarnated - becomes flesh. So our spiritual worship is to include the enjoyment of God’s creation. That is why we celebrate by giving presents and rejoicing in the good things of creation - feasting with our families. This is why Christmas is a time when the community as a whole can agree on enjoying themselves. However, there is a profound difference with our non-Christian neighbours. They enjoy the music of the carols while we enjoy both the music and the lyrics. Even an anti-God “cultural Christian” like Richard Dawkins, can enjoy singing the carols with the rest of the community. But Christians enjoy the musical emotions of lyrics that express our deepest delight. Non-Christians celebrate the food and the family - while we celebrate God become man with food and family. They enjoy giving presents and feasting with their family while we enjoy God become flesh by giving presents and feasting with our family. For at Christmas we Christians rejoice in the creator of food and family who has given the ultimate presents - His Son to the world and the world to His Son. “Fear not, for behold, I bring you good news of great joy that will be for all the people. 11For unto you is born this day in the city of David a Saviour, who is Christ the Lord. " (Luke 2:10-11).